Description: B32-8WH 514, B42’s 45 and 75, and F40 354 were on the northbound CITY OF NEW ORLEANS at Pass Manchac, Louisiana. Title: Eastbound "Lake Shore Limited"
Description: This photo taken on the way to the WC. Description: Dirt engine 45 was rolln down the Savanah line! Description: Moving out at track speed! Description: While I'm happy the U.S. still has some passengaer rail service, I'm embrassed that what we have hardly competes with the service available in many 3rd worls countries! Description: Eastbound Pennsylvanian on track one. Next stop Harrisburg. Description: VERY late Palmetto rolls slowly through acca yard heading for greendale station. Title: 5(16) is a non-Zoom Mode. Description: The Meteor slowed to cross over under the bridge, and now accellerates toward JAX. 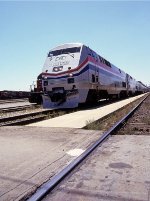 Description: Amtrak Train # 314 arrives at Kirkwood , Mo. 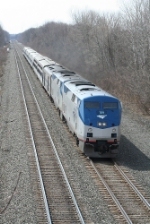 Description: Amtrak 48, the Lake Shore Limited, heads east. Description: The Empire Builder crosses University Ave for the second time in about half an hour as it returns to the depot after turning on the wye. Description: The Empire Buider arrives three hours late. Description: In a rare move, the Empire Builder uses the Saint Paul Sub and Park Jct to reach the depot.